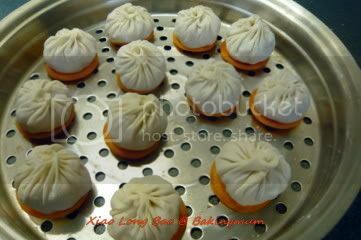 This is how the XLB look before steaming. This is how it look after steaming. This is how it look inside. Mix plain flour, potato starch and shortening together. Add in water to make into a dough. Be careful not to add all the water at one go as you may not need to use up all the water here. Leave dough aside for about 10 mins. Put all the above ingredients into a mixing bowl and mix well. Add in chopped gelatine stock and mix well. Leave it in fridge while you do the dough. Dissolve the gelatine in the chicken stock over a small fire. Leave it to cool down before putting it in fridge to harden. When harden, cut gelatine stock into small pieces to be added into the meat filling. 1. Cut a piece of dough out. Roll out into a long stripe. Cut into smaller pieces of about 6g or 7g or thereabout. Take a small piece of dough and press it into a round shape. Flour it lightly and place it on a lightly floured tabletop and roll it out into a thin round piece. Place some fillings onto the skin and wrap it up. 2. Put it on a thin slice of carrot in a steaming tray. Steam it for 5 mins over big fire. Serve immediately with young ginger and black vinegar. Oh, they sure look like they are from the XLB restaurant! Yummy yummy, when are you sharing the recipe? Thank you for your lovely blog. Delicious, I want to drink the stock/juice! Oh wow, you are amazing. Is there anything you can't cook? Lol! Complete with stock some more. Bravo! Can you please please put up the recipes of each dish you whip up! wats the orange thingy the xlbs sits on ? 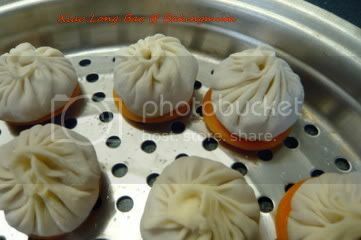 By the way, what's the orange thing under the XLB?? Yeah... share the recipe, can?? OMG .. I LOVE THIS. Dear friends, please be patient and the recipe will be up soon. The orangey thingy is carrot but you can also use cabbage if you like for the base. If not, a piece of cheese cloth is fine too. Oh my god . I am drooling... Please share this recipe. im still not sure whats the chicken powder is. can it be bought on normal supermarkets? and what does the chicken stock with gelatine do? 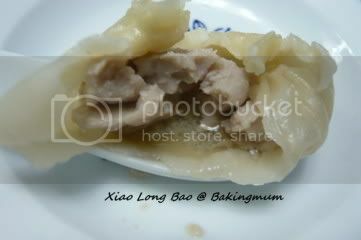 issit the soup inside the xiao long bao?? Violet, chicken powder is those maggi or knorr chicken seasoning powder. The chicken stock gelatine is in solid form to be mixed with the meat filling for easy wrapping. 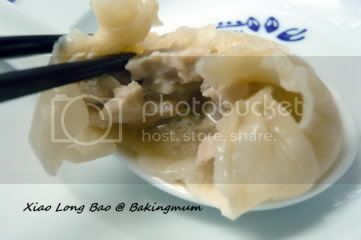 When the xlb is steamed, the gelatine will melt and thus the stock in the xlb when you eat it. You should be able to get shortening from any supermarket or shops selling baking stuff. thanks for sharing your recipe and the video on how you make it is very helpful. Hello Cherryheart, I accidentally deleted your comments, sorry about it. But you were asking about the chiken stock. You can cook the chicken stock yourself or in my case, my shortcut way is to mix 1 tbsp of maggi concentrated chicken stock with 250ml of water. Gelatine is in powder form. I use the right hand to pleat and the left hand to turn the skin around. 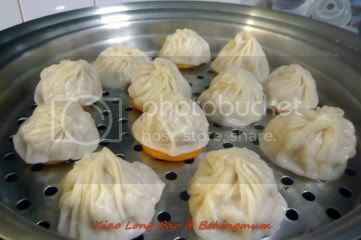 This has really inspired me to go make some cos I love xiao long baos. One question tho' - what can I substitute potato starch with ? I've not seen it here. Hi Chezzyheart, you can get in from Fairprice. It comes in a bottle called Concentrated Chicken Stock. Hi, if I make the XLP in advance, is it okay to put in a greased tray/box and leave XLP in the fridge before steaming when I want to serve? Hi Annie, you cannot do this in advance. You have to do it and steam it immediately. 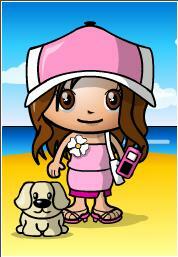 Hi Baking Mum (sorry I dunno how to address u)..
Love ur blog that provides lots of recipes, and food info for us. Mind if I add ur blog to my blog list? Hi Esmeralda, thanks for visiting my blog and of course you can add my blog to yours. Hi Chumpman, I try my hands on almost anything that catches my fancy. Dim Sum is one of them. I have been make guo tie ever so often just because the children like to eat them. Actually I like guo tie more, baking mum. It's just I'm lazy to make guo tie skin and I can buy wanton skin from market. My Dad can make really good guo tie xiao long bao and spring onion pancake. But I gain weight easily so I don't dare to ask him to make for me, LOL ! may i ask what is minced gingle? How to get it? =p or can i buy it off the shelves? Minced ginger = finely chopped ginger. You just need to use some fresh ginger and just chop it up. hi baking mum, i used premium "pau" flour instead of plain flour and tapioca flour instead of potato starch and the skin came out after steaming, a bit hard. why is that? is it because i used the "pau" flour which is meant for "char siu bau"? or because i used tapioca instead of potato flour? can i use corn flour to replace potato flour? Hi Viv, you cannot use pau flour. Need to use just plain flour also known as all purpose flour. You can replace potato flour with corn flour. However, don't use tapioca flour. It will made it hard. I'd love to try out this recipe! Can I use vegetable shortening (crisco) for the shortening? Yes Youfei, I also use Crisco shortening. Of course you are welcome to link to my blog. may i know how many does this recipe make? 12? for the soup, do we need to put it in the freezer or the fridge would do? Hi Shan, definitely more than 12 but I can't remember how many exactly. The soup just keep in fridge to harden. Hi Hugbear, where can I find chicken gelatine, stock and shortening. Is it available at store like fair price? Thanks! Hi Eve, the gelatine is just normal gelatine. Stock you can either cook your own chicken stock or use store bought. Shortening you can find Crisco brand from any supermarket. stumble across your site while searching for making of xiaolongbao. Thks for the wonderful & informative site, the best thing ever - it comes w photos & video tutorial! Do not over knead the dough. It will cause too much gluten to appear. As long as the dough is well mix, leave it to rest for a while. If you keep kneading the dough it will not be good in the result. Thks for d prompt reply. Will give it another go. For the dough, 115g water - is this cold water, hot water or does it matter? I've seen some recipes requiring cold and others hot water. Julie, just normal cool water. No need to be hot or cold. Tried ur recipe. Did them in two batches - one with more kneading and it seemed that dough texture was easier to handle with more kneading. But based on ur advice, I was wary of over-kneading. Loved the filling taste! But the wrapping is truly an art. I couldn't get the nice folds at the top. Mine ended with a "big knot" at the top. So the top was a bit hard. And my carrot bases were simply too small for the expanded XLB. Many got stuck on the steamer and juice oozed out when picking them up. I will definitely try again - next time with napa cabbages as base. Thanks for your recipe!